Located in southeastern Montana, Little Bighorn Battlefield National Monument memorializes the site of the Battle of the Little Bighorn which took place on June 25-26, 1876 between the United States Seventh Cavalry Regiment led by Lt. Col. George Armstrong Custer, and the Sioux and Cheyenne under the political and spiritual leadership of Sitting Bull. The Little Bighorn Battlefield National Monument was originally named Custer Battlefield National Monument. President George H.W. Bush renamed the site on December 10, 1991. It is now representative of those who were in the battle, Native Americans and the 7th Cavalry. A visitor center and museum contains exhibits relating to the 1876 Battle of Little Bighorn in which a total of 263 US Cavalrymen, of the regiments 650 men, were killed in action by Sioux and Northern Cheyenne warriors. Lieutenant Colonel G.A. Custer was killed leading a contingent of 209 men. The Museum features exhibits of the history of the battle, Custer, weapons, archaeology, Plains Indian life, and a walking tour with interpretive markers. It is wheelchair accessible. Adjoining the visitor center is Custer National Cemetery, which includes interments from abandoned frontier military posts, the world wars, Korea and Vietnam. 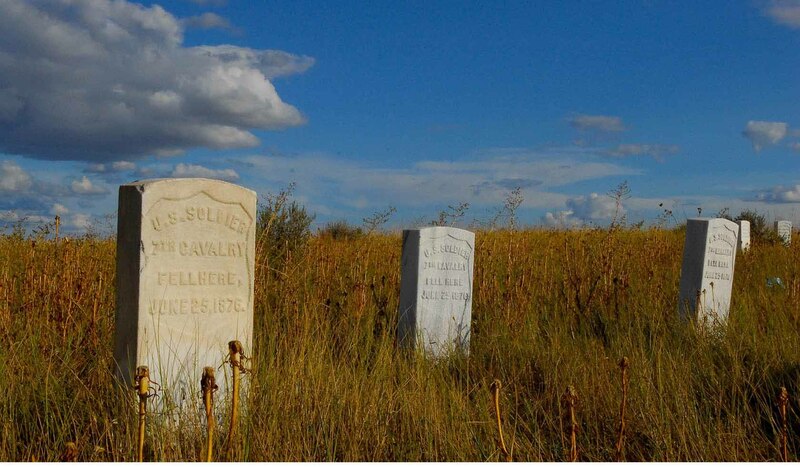 A 4.5 mile self-guiding tour road connects two separate battlefields, the Custer Battlefield and the Reno-Benteen Battlefield. Handicapped parking is located at these two locations and at the visitor center. Ranger programs are scheduled throughout the summer, and bus tours of the battlefield operate from Memorial Day weekend through Labor Day. During the off-season a 17-minute documentary film is shown at the visitor center. Additional information can be found at the the Friends of the Little Bighorn Battlefield's website, www.friendslittlebighorn.com. Little Bighorn Battlefield National Monument lies within the Crow Indian Reservation in southeastern Montana. US 87 (I-90) passes 1-mile to the west; US 212 connects the monument with the Black Hills and Yellowstone National Park. The Crow Agency is 3 miles north, and Hardin, Montana, is 15 miles north. The nearest cities are Billings, Montana, 65 miles northwest and Sheridan, Wyoming, 70 miles south.Little Bighorn Battlefield National Monument lies within the Crow Indian Reservation in southeastern Montana. US 87 (I-90) passes 1-mile to the west; US 212 connects the monument with the Black Hills and Yellowstone National Park. The Crow Agency is 3 miles north, and Hardin, Montana, is 15 miles north. The nearest cities are Billings, Montana, 65 miles northwest and Sheridan, Wyoming, 70 miles south.